This book identifies what is meant by sati (smrti), usually translated as ‘mindfulness’, in early Buddhism, and examines its soteriological functions and its central role in the early Buddhist practice and philosophy. 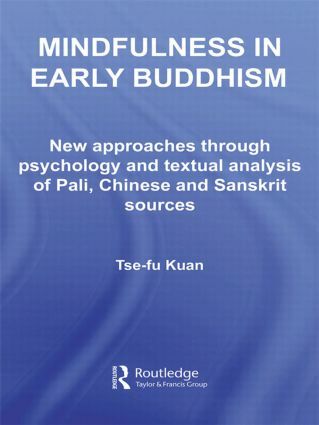 Using textual analysis and criticism, it takes new approaches to the subject through a comparative study of Buddhist texts in Pali, Chinese and Sanskrit. It also furnishes new perspectives on the ancient teaching by applying the findings in modern psychology. In contemporary Buddhism, the practice of mindfulness is zealously advocated by the Theravada tradition, which is the only early Buddhist school that still exists today. Through detailed analysis of Theravada's Pali Canon and the four Chinese Agamas - which correspond to the four main Nikayas in Pali and belong to some early schools that no longer exist - this book shows that mindfulness is not only limited to the role as a method of insight (vipassana) meditation, as presented by many Theravada advocates, but it also has a key role in serenity (samatha) meditation. It elucidates how mindfulness functions in the path to liberation from a psychological perspective, that is, how it helps to achieve an optimal cognitive capability and emotional state, and thereby enables one to attain the ultimate religious goal. Furthermore, the author argues that the well-known formula of ekaayano maggo, which is often interpreted as ‘the only way’, implies that the four satipa.t.thaanas (establishments of mindfulness) constitute a comprehensive path to liberation, and refer to the same as kaayagataa sati, which has long been understood as ‘mindfulness of the body’ by the tradition. The analysis shows that kaayagataa sati and the four satipa.t.thaanas are two different ways of formulating the teaching on mindfulness according to different schemes of classification of phenomena.